I was not aware of this book and documentary until now. It is certainly something I would like to learn more about. At least this question and answer session makes it sound like Prof. Ault has a good handle on things. Undercover in a Baptist church - interesting. 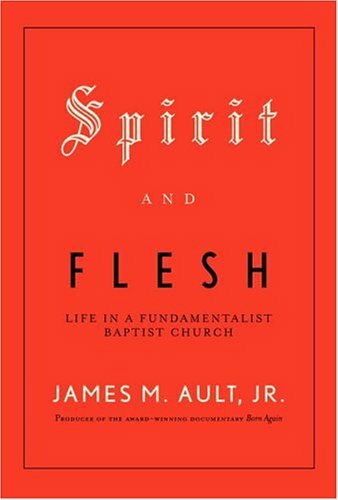 If you have read the book - Spirit and Flesh - or seen the documentary - Born Again, I would be interested in hearing your perspective. Rats! After all my fears that I was going to get blown out in today's NASCAR race, it was looking like I was going to go into week 3 with two wins under my belt. Even though Nemechek had engine trouble early, my man Biffle was leading the race and Gordon was doing what Gordon does -- moving to the front. It was kind of nip and tuck as Earnhardt had trouble early leaving me in at battle with Driver 8 Fan's two top guys; Johnson and Kenseth. Then Kenseth blew a tire! Yes! I started gloating. Maybe I shouldn't have. Because hardly any laps passed before Gordon suffered the same problem that at least four Hendrick cars experienced. It appears a valve stem broke. That put Gordon on seven cylinders. I started watching the points spread shrink -- lower and lower. Had Gordon been able to avoid the black flag and stay on the lead lap I might have had a chance. However, Johnson sealed the deal by coming home in second place. I lost to Driver 8 Fan by a margin of 332 to 314. I call it: Payback for my gloating. Must have been a boring day back in 2000. I wonder if there was anything more important than this happening today five years ago? "Five years ago: Texas Gov. George W. Bush's campaign released a letter to New York Cardinal John O'Connor in which the Republican presidential candidate said he 'deeply' regretted 'causing needless offense' by making a campaign appearance at Bob Jones University, a South Carolina school whose leaders had espoused anti-Catholic views." I'm sure we'll read another one come March. We'll see if Bob Jones III's dropping of the interracial dating policy makes the list. Well, I'm glad I decided to replace Waltrip with Biffle for today's race. However, I am at a loss to figure out what my chance are today. Two of my drivers have qualified in the top five. My third active driver - the one you expect to see in the top five is way down in 28th! Bet things won't end that way. My prediction for today is Gordon gets a top-five finish. Nemechek comes home with a top 15 and Biffle has a blown engine after running strong for most of the day. The 16 and 01 cars tend to qualify quite well, but Biffle seems to either get caught up in something or has engine problems. Nemechek really has what it takes, but he seems to keep having issues in the pits at just the wrong times. Here's hopin' they all pull it together under the California sun - or will it be rain? When I saw the headline for this article, I figured it was another review of Naomi Riley's book of the same name. Then I noticed her name attributed to the piece. So, I read it. In case you are new to StackOfStuff.net, the reason this interests me is because I dealt with Naomi when she visited Bob Jones University in preparation of her manuscript. The article is an adaptation of her book. Frankly, this condensed version is more clear to its purpose than the book itself. She at least has changed her purpose statement to a question. "Can these young men and women become pioneers, bringing an ethical perspective back into their professions, their schools, their communities, and their government institutions?" Her book states these young people are the "missionary generation" who are doing these things. I guess she has read the reviews! It is nice that she recognizes that there are thousands of students who do not wish to exercise what Tom Wolfe calls the "fifth freedom". Much of academia would claim that you are not truly educated unless you are set free from the shackles of religion. Riley shows that there are many who do not agree and show it by enrolling at religious (read "restrictive")universities. Call it "Freedom from the Fifth Freedom." I only wish she would have done more research on how such an education places the graduate on an even - if not higher - playing field with their secular school counterparts. You can read this article to get the play-by-play and if you want the color commentary, read the book. I won't argue the particulars of disagreement with the following paragraph, but will say "amen" to the hypocrisy expressed by those professors at Yale who want to keep their federal funding and keep JAG out. Another irony Schuck presents is that those same faculty members who filed suit against the Department of Defense do not oppose the federal government's power to cut off funding from a university that itself discriminated, citing a case involving Bob Jones University in which law schools publicly opposed the government's subsidization of an institution that discriminated against blacks. Here is another instance of arrogance. This spokesperson for the student body assumes that because her circles have acted a certain way that everyone shares that opinion - both now and in the future. Whether the student body wants it or not, is not the issue. "No other sane employer would have continually sent representatives to campus for two years when faced with zero yield except JAG," he said. "Students decided they didn't want to interview. They made their decision, and JAG kept coming. JAG wouldn't listen to us." If the government is going to be consistent with the ruling against BJU, than Yale should lose their federal funding. Will they sacrifice? Does Yale have the guts? Well, this ain't going to be pretty. If the weekend follows past statistics, I'm going to be hurtin' in my NASCAR fantasy league. I could get my first loss of the season at Fontana: 358 to 452. Even if you toss out last year and just look at Daytona, I'm still in pain: 369 to 464. Then again, why do they race the race? All it takes is a blown engine here, a flat tire there or an accident. Have you heard about the 100% bipartisan bumper sticker? It reads "2008--Run Hillary Run"--the Democrats buy it for their back bumper, the Republicans put theirs on their front bumper. Reckon, I shouldn't post this, someone is going to say I'm advocating the running over of a Senator! She profiles a number of individual schools including: Mormon stronghold Brigham Young University; Fundamentalist Christian Bob Jones University; Catholic Notre Dame and Thomas Aquinas College, one of the quirkiest schools mentioned; Jewish Yeshiva University, and Evangelical (Baptist) Baylor University. Can you believe it? There is actually a school that this author thinks is more quirky that BJU! I do have to say this review at least didn't follow lock-step with some of the others I have read on the book. I still have no great love for the work, but it is an interesting read. Little Josiah was sick last night and this morning with 102 degree fever. The lovely red head stayed home from church in the morning while I took Emma and Jonathan. After church I headed over with the older kids to their grandma and grandpa's to celebrate my birthday. Once we got there, I found out Emma had a fever as well. We came back home just in time for me to see the last restart and Jeff Gordon win! What a birthday present! I was thinking it was going to be a great day with Gordon and Waltrip running up front for most of the day. Nemechek was doing an imitation of a yo-yo and kept going from the top 10 to the 20s and back. It was looking like I would have my three active drivers all in the top 10. Then Waltrip broke and Nemechek started fading. Then everybody else started messing up. Things started looking up again. Then...what a finish (at least if you are a Gordon fan)! Emma and Josiah looked at me like I was going out of my mind. "Go, Gordon, Go!" That was after I was yelling at him earlier for going to the outside to try to pass Stewart, "No, Gordon, No!" I never thought I would say this, but "Thanks, Kurt!" Here is how the league stands. Oooo, he is so smart! I would have ignored this piece written by a yuck yuck student at Ohio University, but it makes an interesting point that many take for granted, but one I disagree with...at least to a point. If you're absolutely dead set on leaving home, it's not too late to enroll at conservative, evangelical and private, Bob Jones University. Never again will you be distracted by evil, angry blacks, liberals, gays and others of the 'Blame America First' crowd. You will be able grow in a homogenized and sanctified garden of scripture and creationist science. Hallelujah! Seriously though, going to a university is supposed to be an opportunity to be exposed to ideas other than your own "family values." It is a time for fruity things like self-discovery. If you and your family are so set on preserving some kind of tradition or whatever (you must forgive me, self-imposition of ignorance is alien to my heathen, liberal heritage) then stay home. Is it really the purpose of going to a university to get exposed to values that conflict with those you have been taught by family? Why can't a university work with the parents rather than against them? Certainly, it is the part of the university to challenge a young mind and stretch them in ways that will help them to grow and develop critical thinking skills -- but why is it that most educators think that means undermining Biblical values? Thankfully, there is a place where young people can stretch their abilities in the arts and the sciences (yes, BJU exposes students to evolution. They know enough about evolution to pass any test presented. It just is taught as it really is - a hypothesis and one that seeks to undermine scripture) and still not betray the family. The University also stretches students in another way -- it disciplines them. Shock! No binge drinking? No co-ed dorms? Rules?! Yes. We'll stack our students against those of Ohio University any day. The proof is in the graduates. Mikey gives PR the best finish of the day. Waltrip finished 7th in the race. Hey, a top ten is good. Looking forward for even better tomorrow...I hope! Greg Biffle followed Waltrip across the line in 8th. Another top ten. Makes me start to wonder about sitting him tomorrow. Still, even though he finished in front of Nemechek, I still think the 01 is the best choice for tomorrow. Speaking of the 01... It would have been nice had he won from the pole. Still, he seemed to be able to work past the tight situation he had early and the jack problems later in the race. Sans some slipups tomorrow, I figure him to join Waltrip and Gordon in the top ten. Here's hopin' Gordon takes the top spot and Waltrip and Nemechek get top tens. For tomorrow's Daytona 500 I go up against 20Buck. I really don't have an argument with this piece other than I think Mr. Galen could have used a better illustration. So, I sent this along to him and I am including it here because I figure there will be no correction made. "* There is a difference between what would be seen as acceptable speech by a professor at Bob Jones University and one at the University of Colorado. A professor at Bob Jones who advocated for interracial marriage would, we suspect, be on the next bus out of Greenville, South Carolina." However, you are correct - if you use a different illustration. A professor who would advocate atheism, for instance, would certainly be sent packing - and it would be right to do so. Unlike the University of Colorado, the doctrines of Christianity are central to our charter and reason for existence. To attack those doctrines - I do not say to question the doctrines for the sake of teaching - would be to fail to uphold the charter the professor agreed to uphold when he or she joined the University. Please, don't take this in the wrong way. I enjoyed your piece and agreed with it. I only wanted to make sure you were aware that your illustration is somewhat dated. Well, I've decided to put Biffle on the bench for the 500. The statistics show he is the weakest of my four drivers - by a significant margin. I also was not real thrilled with how he faired against the competing drivers during his 150. I still think he is a good choice for the team - in the long run. Nemechek is off the bench and in the game. He was running well in the 150 until Harvick pulled his stunt. He will have to go to a backup car, but it was the same one he used in the Shootout. I'm feeling pretty good about my team of Gordon, Nemechek and Waltrip - and to think I once considered benching Waltrip for the 500! A sad but funny thing happened yesterday. I was unable to watch the second 150, so I turned on the DVR to record it. I got home, did my husband duties and then settled in to see what I was told was a very exciting race. Twenty minutes into it the race suddenly switched to a Tim Allen movie. I stared at the TV screen in shock! Turns out that when my wife came home from grocery shopping Thursday afternoon she found the entertainment system making lots of noise. So she turned off the DVR! I received a call from Paul Alongi earlier this week asking for an interview with Bob Jones III or Stephen Jones. He wanted them to comment on the "growing interest of evangelicals in environmentalism." Of course, my first thought was, "Why the Joneses?" Their focus is education and theology - not environmentalism. I informed him that this was not something about which they would feel knowledgeable enough to comment. Then I pick up the paper this morning and read, "Bob Jones III, president of Bob Jones University, turned down an interview through a spokesman. His son, Stephen Jones, who will take over the university after his father retires in May, did the same." What on earth does this have to do with the story? If they were somehow involved in this, it would make sense. However, they have no connection with the Jeremiah Project or any other pro or anti-environmental causes. This paragraph should never have appeared in the piece. Why didn't Paul ask for the recycling coordinator at BJU or the student volunteer group that participates in river cleanups or one of the BJU political science professors? I would certainly think they would be more knowledgeable than the Joneses. I wonder if most reporters really know the definitions of words such as evangelical. More and more I find reporters think it is more of a political movement than a theological one. Just recently, Time Magazine listed their top 25 evangelicals. The criterion for the list was not so much their influence in Christianity, but their influence in motivating evangelicals politically. Because the focus was political a couple of very good conservative political figures made the list, but they were Catholic – which by definition cannot be evangelical. First, it is VERY debatable that dispensationalists make up a minority of evangelicals. Most all Southern Baptist churches (one of the largest evangelical denominations) hold to a dispensational view of eschatology. Second, “they don't have to worry about environmental matters” is a false statement. What dispensationalism teaches is that mankind cannot bring about a perfect world – only God can the return the world to its perfect state (The focus here is not even on the physical earth, but the culture of mankind). However, that does not mean that Christians should not be good stewards of the earth. It was one of the original mandates God gave to mankind. It is true that evangelicals should not view the earth as something to be worshipped or the source of our life and “energy.” It is also true that evangelicals should consider the souls of men more important than the environment. However, the two are not mutually exclusive, as the above statement seems to insinuate. This does open a debate within the Church. What should be the main purpose of the Churches existence? Should the primary focus be on the temporal or the eternal? Do we incorporate the eternal into the activities we take part in on this temporal earth? Or do we focus on the temporal simply for the sake of the temporal? My personal belief is that it is the Churches responsibility to focus on the eternal. This teaching of loving God with all your heart and loving your neighbor as yourself should then drive the individual Christian to a great feeling of responsibility for those around him. It is the responsibility of the individual to be a good steward of the earth God created. Environmental concern is a good thing – so long as it does not become a distraction away from the eternal. We are to be stewards of the earth – the earth is not to be the steward of us. There in lies the greatest difference between the evangelical and the religious environmentalist. Last year on Stackofstuff.net, I kept track during the race season of the "What If" standings. It was quite a bit of work! This year I don't want to do all that work keeping up with the season, so I decided to join a fantasy league with some of my buddies. Gordon is an obvious choice. He may not win the whole thing this year, but he is always a threat. He is the leader of my team and really my only sure shot. I was excited to get this trade. Biffle could be set for a break out year. I don't expect to see him win the championship, but he is set for a solid year of good finishes. I expect to see him get a win this year. Why Joe Nemechek? Call it my gut. He finished so strong toward the end of the year. Also, he is now running Hendrick engines and has a solid team behind him. Besides, I just like the guy. I'm calling him my dark horse. I contemplated dropping Waltrip and picking up a free agent. But man, I just wish I had that much hair! Seriously, I did hesitate when I learned he was assigned to me, but the statistics showed he is the better choice over any free agents. He also has connections with DEI and had he not caught up in wrecks, he would have done much better last year. I will have to sit one driver during the 500. Right now I am going to sit Nemechek. I'll wait until Sunday do make my final decision. Boogity, boogity, boogity! Let's go racin'! Here we go...It's that time again! I'm going to have to use the ol' DVR. I'm taking my lovely redhead down to Helen, Georgia for a Valentine's weekend. So, I'm going to miss the Shootout. Junior and Gordon start off side-by-side. Hope that won't last very long! Here's a welcome to a new member of the McCaskill family. Junior is a little five-pound daschund. I have a funny feeling he may pick up another nickname, "Budman." I just hope he won't take up drinking!